Perennial much branched, leguminous forb or ascending shrub, 3 to 10 feet (1 to 3 m) in height with three-leaflet leaves, many small Purple-to-white pea flowers, and single-seeded pods from a woody rootcrown. Dormant brown plants remain upright most of the winter. Ecological Threat: Shrubby lespedeza is an extremely aggressive invader of open areas, forming dense thickets, which displace native vegetation. History: Introduced from Japan as an ornamental in the late 1800s. Later programs promoted use for wildlife food and soil stabilization and improvement. Still planted for quail food plots. U.S. Habitat: Forested and Shrubby areas. Bugwood Network. Lespedeza bicolor. 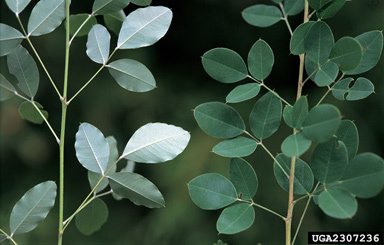 Accessed 19 August 2010 (http://www.invasive.org/search/action.cfm?q=Lespedeza%20bicolor).